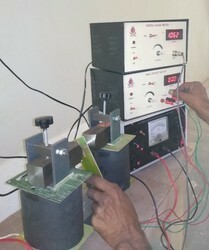 We offer Hall Effect Setup usefull in physics and material science labs. We are engaged in manufacturing & supplying a wide range of Hall Effect Experimental Setup. 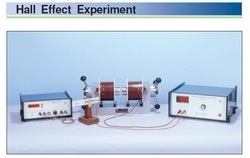 This setup consists of all the apparatus required in Hall Effect Experiments. · Germanium crystal mounted on a pcb with four connectors/probes. Four wires for crystal connections are provided with banana plugs at the end. Digital gauss meter, hall effect set up digital power supply for electro magnet electro magnet gauss probe hall probe. We are ranked amongst the most trusted firms deeply engaged in offering a wide range of Digital Gauss Meter. We are engaged in offering Hall Effect Setup. Our reputed entity is engaged in supplying Hall Effect Set Up. We are a top notch supplier of Hall Effect Setup. The Hall Effect Setup Nvis 6101 is a very useful system for the laboratory. It is used for the study of Hall Effect in semiconductors. The Hall Effect is an important observation in material science.